Los Angeles, CA- April 4, 2017 Axonom, a global provider of visual configure-price-quote CPQ software, today unveils Powertrak Dynamic Wiring, software automation for connecting complex wiring systems in racks and data center facility designs, at Data Center World Global 2017 in Los Angeles, CA. Dynamic Wiring is an advanced feature in the Powertrak Visual Product Configurator suite that simplifies the selection of wiring cables, ensures accurate connections and configurations, and speeds the quote-to-cash process. It saves consumers with little-to-no technical knowledge both time and money by connecting ports between devices, and calculating cabling type, length, and cost in both a singular rack configuration and the entire data center layout design. 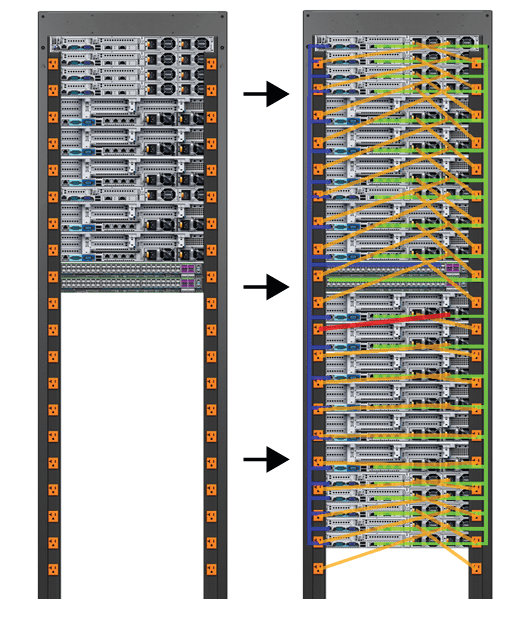 "Manually connecting equipment in a rack with a clearly defined and organized cable pathway is time consuming, expensive, and prone to errors," said Mike Belongie, COO at Axonom. "For some, it takes one or two business days to define, lookup, and measure required cables for server, storage, and power supply products. Powertrak Dynamic Wiring reduces that process from days-to-seconds." Data Center World 2017 exhibitors and attendees are invited to booth 742 for full participation in designing a data center rack using Powertrak 3D Product Configurator, then experiencing it in virtual reality. The immersive VR experience, powered by Powertrak VRoom, transports users into a virtual data center environment where they can interact with rack equipment using the HTC Vive, visualize how components are connected, and explore the rack layout in the environment. "We welcome attendees to experience a data center rack in virtual reality and move servers, storage, and power components from slot-to-slot. They will experience first-hand how equipment relocation or removal affects the pricing of the cabling package," said Belongie. Data Center World 2017 is the global conference for data center, facilities and IT professionals. Conference attendees will find Axonom and over 140 other exhibitors in the expo hall at the Los Angeles Convention Center on Wednesday, April 5, from 12:00pm-6:30pm, and Thursday, April 6, from 12:00pm-4:45pm.